We will explore the viewpoints of our two speakers in one post. Ronald Bailey first, then Christian Early.- Ed. Friday was an eagerly anticipated day for the EMHS biotechnology class. It was the date of the 16th annual Biotechnology Symposium, which this class traditionally hosts. This year the professional speaker was the science writer Ronald Bailey. Bailey’s accomplishments include having a weekly column in Reason magazine, a published book titled Liberation Biology: The Moral and Scientific Case for the Biotech Revolution, and having various articles and reviews published in The New York Times, The Wall Street Journal, The Washington Post, and many others. Bailey does not associate himself with Christianity, giving him a very unique viewpoint compared to many EMHS students and faculty. Bailey’s topic for his lecture was titled Transhumanism and the Limits of Democracy. Transhumanism is a term describing human enhancement, including the areas of intelligence, athleticism, and the curing of disabilities. The process is done by taking a genome scan and replacing the undesired genes with preferred ones. The ethics of these procedures are highly debatable; however Bailey is on its supporting side. In response to the presentation by Ronald Bailey at the Biotechnology Symposium, Dr. Christian Early, a professor of philosophy at Eastern Mennonite University, stated some of his thoughts on transhumanism. Dr. Early broke transhumanism into two categories – gradual, like embryo scanning, and radical, like manipulation of genetic make-up. Dr. Early began his response with a description of some of the similar views that he and Mr. Bailey shared. Both Dr. Early and Mr. Bailey feel that scanning for disease is ethical, and perfectly acceptable. As Dr. Early put it, “If we can see it coming, for heavens sake, duck!” He feels that a disease scan is a way that humans can use medicine to do what it's meant to – prevent and cure. Dr. Early moved on to answer a question he proposed: What does it mean to be human? He brought out several points in which he gave his answer. With these points in mind, he criticized the idea of people being able to possibly choose their children's personality types – how would these kids be able to navigate in the world without natural emotions? He feels that if genetic make-up is modified, kids may be seen as different; a product of a project. Another aspect of transhumanism that was a concern of Dr. Early's was the relationships that would be formed with genetically engineered kids, their parents, and their peers. He pointed out that if kids were modified by their parents, it would seem to produce no spontaneity in having kids. However, kids never, ever come out the way parents think – think of the “magic marker on antique furniture.” When a child doesn't conform to “expectations” set by the parents before birth, Early questions whether or not they will be able to attach themselves to parents who the child doesn't think they are “good enough” for. He also wonders whether or not genetically modified people would have to be set apart. What about those genetically designed to be honors students, or the genetically engineered athletes? Would they be an entirely new race and class of human? 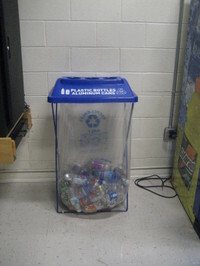 You may have noticed the blue recycling containers scattered about the school – one by the dining hall, another in the lounge, and a third in the gym. The containers, designed for collecting recyclable plastic bottles and aluminum cans, are part of a student run initiative, having been placed there by the wise and beneficent SCO Executive Committee. The project was planned with input from the head of EMU’s recycling program, Jonathan Lantz-Trissel. Lantz-Trissel suggested using the prominent blue containers (known as “Clear Stream Recyclers”) and allowed EMHS to utilize EMU’s recycling collection area. An announcement about EMHS’s new program was made during the SCO introductory chapel several weeks ago, but the containers were only recently set up. To help manage this and other recycling projects aimed at promoting good stewardship of resources, the SCO is creating a “Recycling Committee.” This group will ensure that bottles and cans destined for recycling are periodically gathered up, sorted, and taken to EMU’s recycling collection site. The group will also make certain that the sometimes neglected paper recycling bins in various rooms are routinely emptied. Additionally, if the SCO manages to implement some form of composting, the committee will likely a hand in overseeing it. The SCO is always willing to hear new ideas from students; anyone wishing to join the Recycling Committee or offer suggestions may talk to a member of the SCO Executive Committee. The SCO believes that each of us has a responsibility to use our limited resources wisely; every bottle, can or paper we recycle is a small step in that direction.